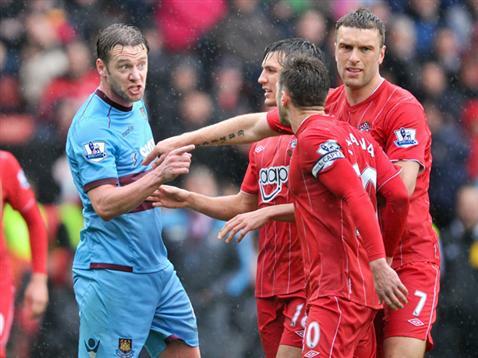 West Ham’s Kevin Nolan winning friends and influencing people once again. Saints were without Shaw, Puncheon and Rodriguez to face West Ham, most likely the latest victims of a bug that had forced Boruc off the pitch in a recent game, but only Shaw was too poorly to make the bench. That left Lambert as a lone striker, with the manager presumably unwilling to try forgotten man Mayuka as we are still desperate for league points. Along with continuous rain and West Ham’s controversial style under Big Sam, it made for a drab afternoon – but Saints can claim to have had the best moment of the opening half when Lambert stole in on the far post to connect with Ramirez’s free kick, only to see Jaaskelainen manage to push the ball onto the post and out to safety. Lambert also went close with a header, but you sensed that he was missing his in-form partner, and the Saints goal came from another route. It was somewhat fortuitous as Ramirez’s first effort was blocked before the ball fell nicely for him to have another, more successful, try from closer in. Saints didn’t defend very well from the kick off and had difficulty in keeping out the Hammers’ swift response, but the game had settled down again before Hooiveld injudiciously fouled Diame on the edge of the box. In what seemed to be a pre-arranged plan, Lallana broke from the wall to try to charge down the kick, taken by Carroll, but that left the cover in a bit of a mess and the ball found the net via a deflection off Steve Davis. Rodriguez and Puncheon both made it on to the pitch, with the former’s contribution belying claims that he was sick – either that or we should make his medication widely available. A draw was fair enough at the end of the day, with honours even in the battle for 11th place and both sides seemingly happy with another point towards safety. LSSC Man of the Match: Steve Davis, who couldn’t be blamed for the goal. More of a day for his type of player than the likes of Lallana or Ramirez.